Ashley Meadows has a tough job. As the gallery guide coordinator at the Hirshhorn Museum in Washington DC, she tries to get people to talk about modern and contemporary art. Consider the look of panic on people's faces when they're urged to express an opinion about a Jackson Pollock painting. "It's hard to start a conversation with a stranger," Meadows, 33, said. But these days she has an ally in her efforts: a small humanoid robot named Pepper. The human-shaped robot stands four feet tall on one tapered leg, a shiny white body and big puppy dog-like eyes. Tucked into the curves of the Smithsonian's brutalist modern art temple, Meadows watches Pepper entertain guests. It dips at the waist, plays music and offers to take selfies -- the most popular of Pepper's tricks. This particular Pepper is one of a 25 strong army of robots at The Hirshhorn Museum and three other Smithsonians in the city, including The African Museum of Art, the African American Museum of History and Culture and the Smithsonian Castle. The robots made their debut this week. 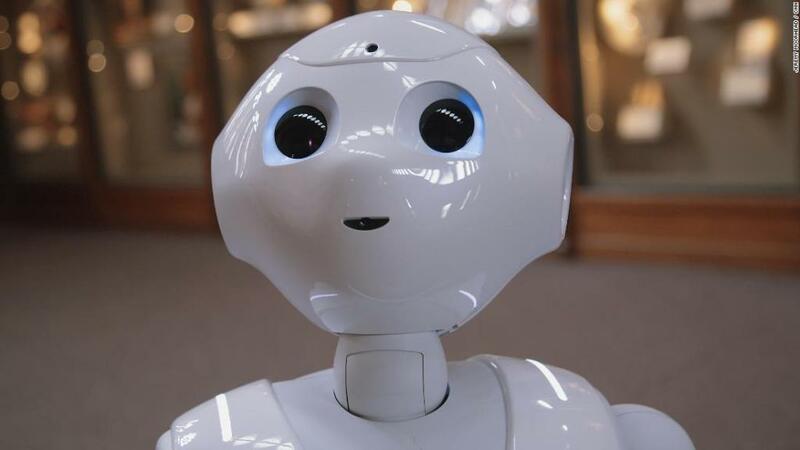 Pepper was donated by its manufacturer, the Japanese company Softbank Robotics. Pepper, first unveiled in 2014 in Japan, can be programmed for different use cases, whether it's at restaurant chain Pizza Hut, airports or now museums. But Pepper has limited functionality. It won't go off script but can tell guests a story, give them more information about a piece of art or "do something fun," like play music and dance with guests. Rachel Goslins, Smithsonian's director for the Arts and Industries Building, hopes Pepper's presence will encourage people to be more engaged as they walk through the galleries. "I'm the mother of the robots," Goslins said. She decides which museums they're stationed at and and what they do. They're typically positioned in spots where she hopes for increased traffic or for people to linger longer. "They're attracted to the robots like a magnet," Golsins said of its success so far. Pepper has already doubled foot traffic to a frequently missed section of the Museum of African American History and Culture -- the second floor educational gallery. But Pepper isn't perfect. Some visitors complained the robot couldn't speak or understand any language besides English. Others repeatedly asked Pepper questions it couldn't answer. Each Pepper robot has bodyguards to make sure the system is properly functioning, its software is updated to protect against hacking and that people don't harm the machines themselves. After entertaining visitors for most of the morning, Meadows powered down Pepper for a rest. The robot's eyes went dark and its white form slumped over like a puppet released from its strings. "Say bye, Pepper!" said Meadows, wheeling the robot off the floor.